In the scheduled reports tab, you can see the title of the Master Report, Snapshots being generated, reports' update frequency, update date, click on the single arrow button at the left most column of each master report will expand the row and show you all the report snapshots being generated and allow you to edit, view, download or delete each snapshots. The buttons bar above the table allows you to create copies for any master report, archive a master report (which will move the master report to Archived Reports and stop snapshots from generating) or delete a master report. 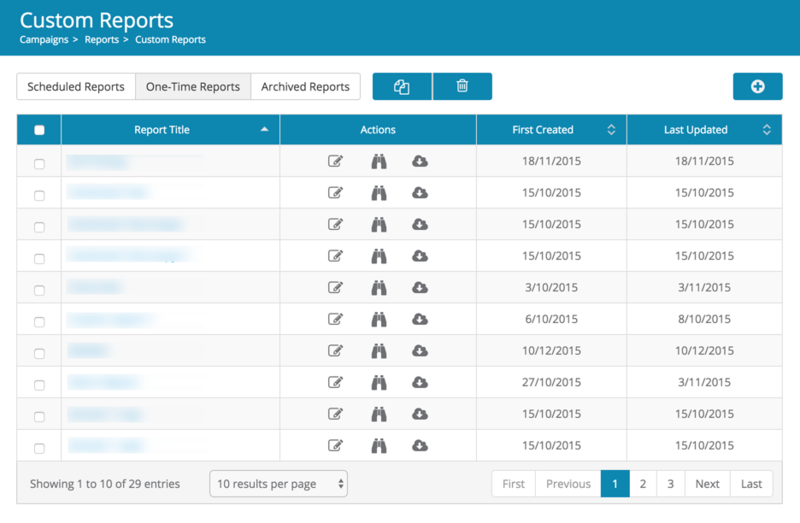 Similar to Scheduled Reports, at the One-Time Reports tab you can edit, view or download any reports shown there, view their created and updated date. You can also make a copy or delete any of them with the buttons bar above the table, since One-Time Reports aren't generated automatically like scheduled custom reports, Archive Reports option isn't available here.